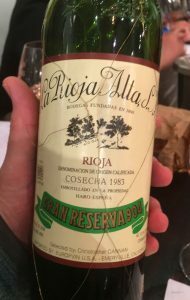 1983 La Rioja Alta, Rioja Gran Reserva 904, Haro, Spain. One of Spain’s most iconic producers, Bodega La Rioja Alta was founded by top growers in the high elevation La Rioja Alta zone back in 1890 to craft high quality red wines for export, as Bordeaux and most of France was trying to recover from the devastating phylloxera plague, and since then has become one of the wine world’s most prolific wine estates. As the winery notes, in 1904, La Rioja Alta absorbed Bodegas Ardanza, and gained access to some of the finest and historic vineyards in the Rioja Alta district, and this luxury 904 bottling commemorates this important milestone, and it’s a wine that can easily be compared to the great wines of the world, especially in great years, such as the one I got to taste recently, these are wines of amazing pedigree, class and longevity, rivaling top Chateaux of the Medoc. The 904, is usually mainly Tempranillo (90%) from the villages of Briñas, Labastida and Villalba along with some old vine Graciano, the wine is fermented in stainless steel with careful selections and cool temperatures then moved to used American oak barrels for natural malos, which can take almost a hundred days, this elevage is very lengthy and includes racking every six months, lasting around 4 years in cask before the final blend is chosen. They bottle the top cuvees unfitted and without fining, allowing them to sure sublime purity, and this gorgeous 1983 is an excellent example of this! La Rioja Alta coppers their own barrels, tailoring the wood to their needs, much like Gaja, the famous Piedmont Barbaresco producer does. La Rioja Alta is a large winery with some 50,000 barrels in their caves, but the attention to detail and quality of each wine shows their passion and commitment to quality. Getting to dig into history in the bottle is a wonderful treat, a huge thank to Michelle Ross of Pisoni Vineyards for bringing this bottle to share with us at our tasting group’s blind Spanish red tasting (January 2019) it was a quite a treat and experience, and it must be said this bottle was in near perfect condition, a truly stunning wine. I’m grateful to get to report here on this glorious Rioja, it showed remarkably freshness and detail, still vibrant and full of life with luxurious layers of perfectly mature flavors showing black cherry, mulberry, fig paste, reduced plum and currant jam fruits along with a hint of earthy forest/wild mushrooms, plus floral notes both dried and freshly cut, cedar, vanilla, coconut and a light dusting of spices and herbs adding cured ham, anise and sweet pipe tobacco. The textures are opulent and refined, the mouth feel is exceptional with a medium weight dreamy palate, this 1983 is just rocking right now, though still has structure and could go another for decade maybe, though I think it is in its best form right now, it is absolute brilliant. While is not easy to find these older wines, the current releases of this 904 are awesome and at around $65 a bottle, they are ridiculously well priced for collectors and those looking for serious cellar options that you can drink even in their youth, also, you should not miss their regular Reservas, in particular look for the Vina Ardanza, it’s an insane value.